Looking for an accommodation in Greenwich Village NYC? From stylish boutique hotels to more convenient properties, here are 7 of the best Greenwich Village hotels. Greenwich Village, NYC has always been home to free spirited artists, cradle of counterculture and birthplace of civil rights movements. Today, it remains a lively hub of the Big Apple’s artsy crowd, attracting visitors from all over the world. 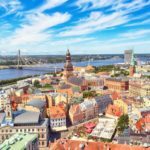 All through the year, the Lower Manhattan boroughs of New York City are wonderfully walkable, so you definitely want to find accommodation in a central spot. 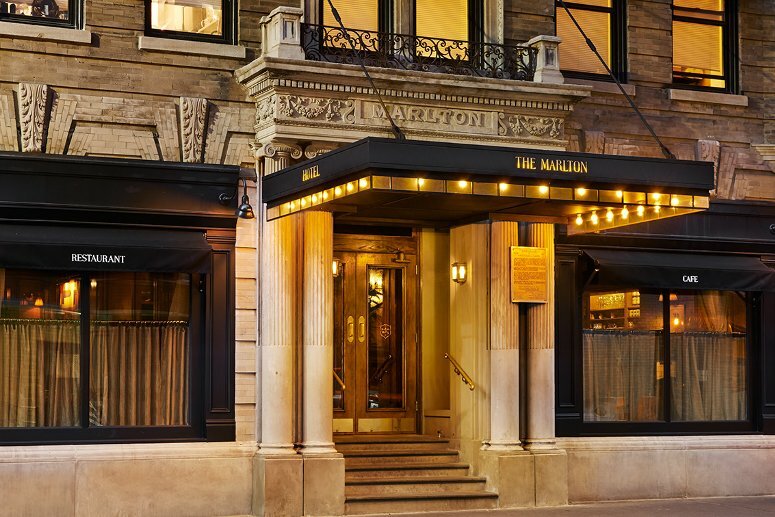 Treat yourself to one of the best hotels in Greenwich Village to get the full experience of NYC, especially when it comes to its incredible nightlife. Contemporary history buffs and style lovers alike will love the laid-back yet perfectly polished vintage feel of The Marlton. Thanks to its phenomenal location at the heart of Greenwich Village, this hotel has hosted many counterculture icons of the last century, from famed Beat writer Jack Kerouac, to scathing comedian Lenny Bruce, to radical feminist and Andy Warhol assassin Valerie Solanas. Its foundation dates back to 1900 as one of the district’s many flophouses (short-term, inexpensive lodging once popular in this artsy, alternative cultural hub); since its renovation, just a few years ago, it has become a tasteful, cozy and character-filled boutique hotel in one of NYC’s hottest neighborhoods. Don’t be put off by the diminutive size of its rooms: you’ll fall in love with its exquisitely worn and comfy common areas, as well as the superb dining experience at Margaux, the French bistro-inspired in-house restaurant. Don’t miss the amazing breakfast! Treat yourself to breathtaking views of one of NYC’s liveliest neighborhoods, with impressive floor-to-ceiling factory windows in every room. 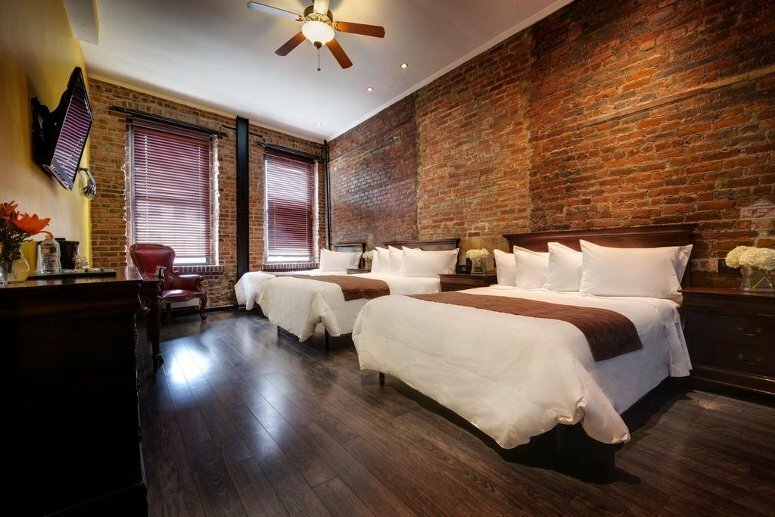 The Bowery Hotel is located in the heart of what was once a slum, now a classy and hip district just minutes away from the hottest nightlife in Manhattan. Enjoy the welcoming atmosphere of the lobby, tastefully furnished with rich tapestries, vintage-inspired seating and warm fireplaces; a standout guest highlight, it’s the perfect setting for mingling with stylish locals (and the occasional celebrity!). The hotel restaurant, Gemma, is highly recommended by locals, and offers authentic but polished Italian comfort food in a rustic Tuscan-style decor setting. Rooms are designed to capture the classic loft-style of New York apartments, with luxurious and warm detailing such as antique rugs, brass fixtures, marble bathrooms and rain shower heads. Located in Manhattan’s old printing district between Soho, Tribeca and Greenwich Village, the Arlo Soho is a fashionable choice for both party-goers and travellers looking for a quiet retreat. The rooftop bar offers cocktails and craft beers while enjoying the skyline view, while the lobby-level liquor bar is perfect for savoring your favorite drink while relaxing in the stylish yet cozy library. Rooms are small but incorporate clever design that make them feel innovative and almost spacious: integrated tech, sharp design and solid walnut alcove beds with well-thought out storage solutions. The hotel restaurant is a popular local haunt for lovers of hearty Southern fare; Meat+Three features a deliciously simple build-your-own menu, where you can pick your main dish and match it with three sides. Don’t miss the in-hotel shop, open 24-hours and stocked with local artisanal goodies — perfect for the midnight snack after a night out on the town! Bright and airy cosmopolitan decor dominates both common areas and rooms of the chic NoMo hotel, located in SoHo and just minutes away from Greenwich Village and Little Italy. The beautifully decorated rooms, in relaxing palettes of white and blue, feature airy loft-style windows with incredible views, as well as a number of high-tech amenities. Floors 15 and above have the best views of New York City, so be sure to take full advantage of the breathtaking floor-to-ceiling windows! Take a stroll down to the greenhouse restaurant, and immerse yourself in a dream-like conservatory space filled with hanging plants while enjoying its contemporary American cuisine and fresh, local produce. If you’re a fitness buff, you won’t be disappointed by the fitness center: it may be small and intimate, but it is packed with state-of-the-art machines and personal screens with headphones. 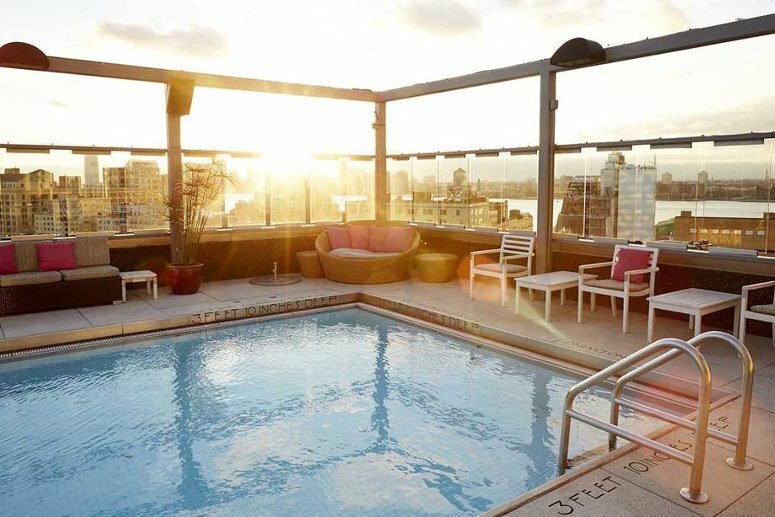 Featuring one of the few rooftop swimming pools open year-round, the Gansevoort is a glamorous choice for party-goers and families alike. It is one of the precious few hotels in the heart of the recently revamped Meatpacking district, full of swanky clubs and amazing restaurants. 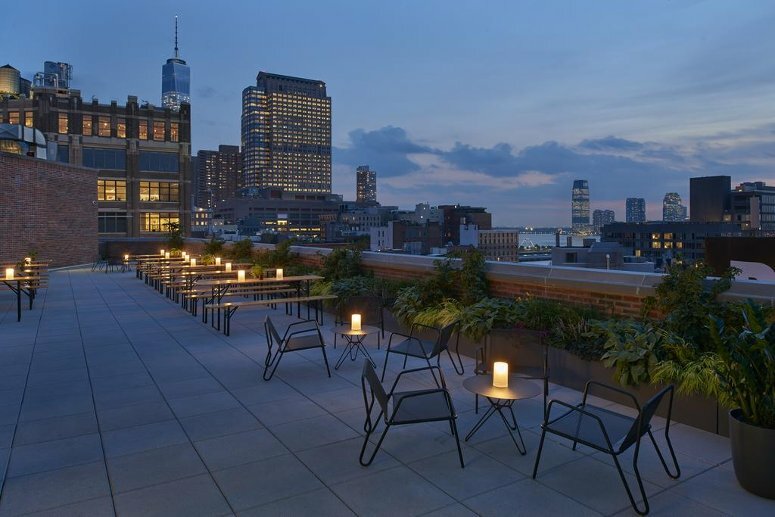 The rooftop bar is one of the local nightlife hotspots for visitors and locals alike, and swimming above the rooftops of Manhattan makes it a truly magical experience! Guests love the superb comfort of the rooms, featuring luxury bedding and a pillow menu for a guaranteed restful sleep after a night of club-hopping. The modern and trendy exterior appearance of the hotel building perfectly matches its character; rooms are decorated with bold colors and contemporary style. 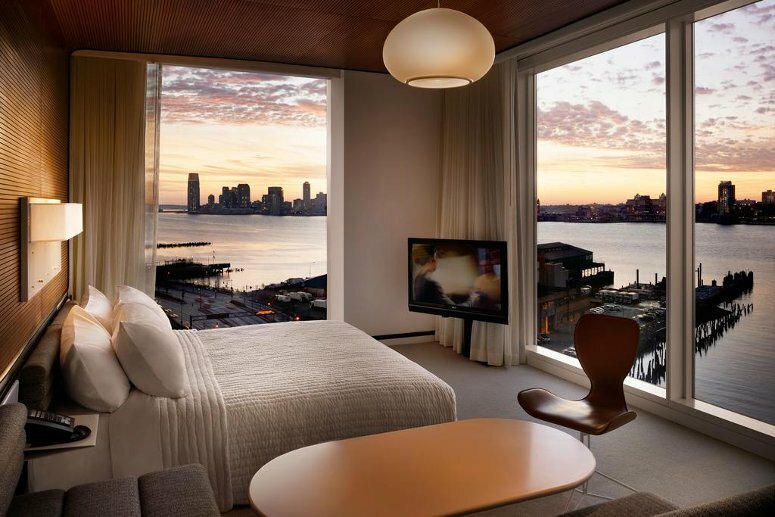 Try and snag a west-facing room toward the Hudson river, as the view is absolutely breathtaking at sunset! The new High Line Park in NYC is a beautiful example of groundbreaking urban design, and the Standard’s unique architecture is a perfect match. This one-of-a-kind hotel building actually straddles the elevated park with concrete pillars, for an incredibly striking floating effect! In addition to its perfect partygoing location in the Meatpacking district, the hotel’s 3 bars are sure to make your stay truly memorable: the casual and relaxed Biergarten on the ground floor, the chic and swanky Le Bain featuring a plunge pool and rooftop view, and the ultra-exclusive (and often private) Top of the Standard, a closed-list lounge open to the public only at limited times. 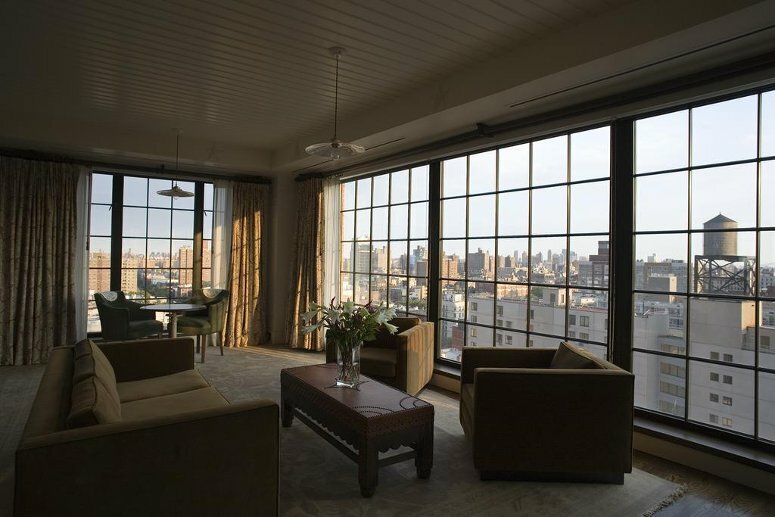 Wall to wall windows in the cutting-edge design rooms give breathtaking views of the Hudson river and the surrounding NYC boroughs of Greenwich Village, Soho and Lower Manhattan. Don’t miss dinner at the Standard Grill, a chic bistro serving fresh, local new American cuisine, but make sure to make a reservation in advance — this eatery is popular among locals as well! Planning a visit to New York City can get pricey, especially if you’re looking for accommodation in Manhattan’s trendiest boroughs. 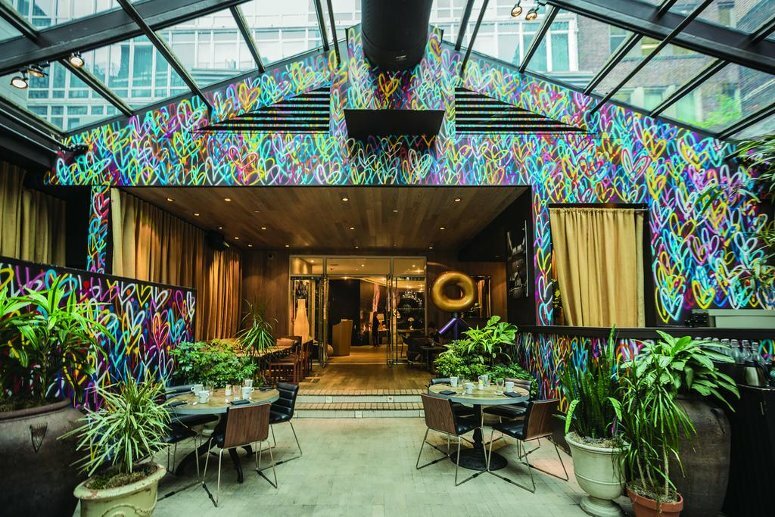 A great budget-conscious solution in the heart of The Bowery, Sohotel is an affordable, historic boutique hotel with great eclectic style and prime location. Just a few steps away from Soho, Greenwich Village and Little Italy, this functional and no-frills accommodation still offers all the little luxuries that make you feel at home, including supremely comfortable Therapedic mattresses and iPod docks. Its boho-chic decor with exposed brick walls hails back to this institution’s humble beginnings as a flophouse; today, gentrification of the neighborhood make its location one of the hottest real estate in the city, and Broome street one of the liveliest nightlife hotspots. On the ground floor you will find the amazing Randolph Beer, a rustic saloon with a great selection of craft beers, local artisanal ales, mouth-watering burgers and a terrific atmosphere. 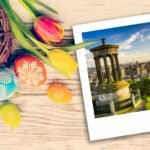 Well-loved by locals, make sure you don’t miss out! Take a map of New York City and you’ll immediately notice something different about Greenwich Village: the neat grid of Manhattan makes way for a decidedly less orderly set of streets and alleys. 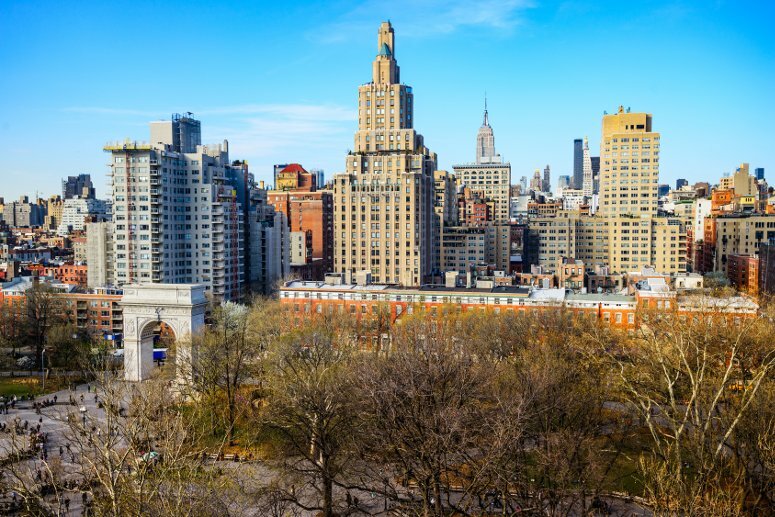 As any local will tell you, the best way to truly experience the trendy bohemian vibe of Greenwich Village in NYC is going with the flow, breathing in the history, and opening your mind to America’s beating cultural heart.